Despite the fact there are an inordinate number of media players available, it is difficult to find one that is quite as well rounded as Windows Media Player; the application included as standard with Windows. Many other media players are either overloaded with features you will never use or stripped down to the point where the few extra features you are likely to use on a daily basis are missing. Just recently, however, I was pointed in the direction of Spider Player, an application that is available via a free download at www.spider-player.com. Admittedly this is just a music player and does not support videos files but focusing purely on audio allows it to excel in this area. It offers a 32-bit sound processing irrespective of the specification of your sound card which should ensure a high quality of playback of all your audio files. The player also supports 5.1/7.1 surround as well as traditional stereo/mono audio files. Standard features such as the ability to open individual files and create and save playlists are also included along with a wonderfully simple equalizer panel which is available at all times. This can be minimised if you should wish but this feature, along with the DSP effects manager allows you to customise the sound of the playback to your personal taste. 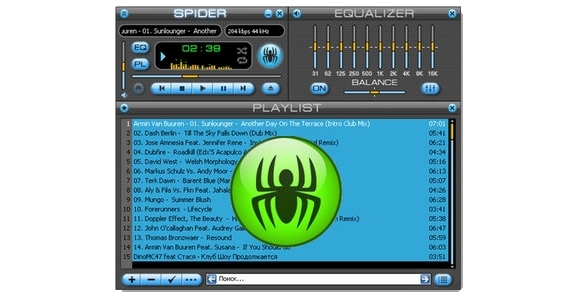 Along with supporting every conceivable file format, Spider Player will also allow you to convert existing audio files in to another format; for example to change a WAV file to a small MP3 file. This is provided in addition to the ability to rip tracks directly from a CD and then convert them in to a number of formats including MP3, WMA and OGG. Direct access is provided to a number of Internet radio stations and can record up to five minutes of transmission to any one file (recording time is unlimited in the professional version). While the standard design of the player is relatively pleasing as it is, the player is fully skinnable with a variety of designs available for free from the developer’s website. If you would rather personalise your own player, there is a skin development package available for download from the website. Users who require the ability to play video may be best looking into downloading the excellent VLC Media Player, one of the many alternatives mentioned in Click over the years, or sticking with the faithful Windows Media Player. For those that are primarily concerned with music, Spider Player certainly comes highly recommended as although the claim “The Ultimate Music Player” may seem rather grandiose it certainly comes with all the features I could hope for without any of the chaff I would have previously tolerated.